I am in big trouble. 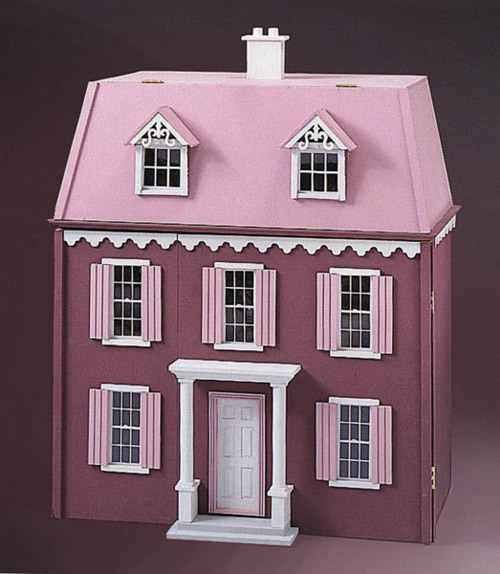 I just bought ANOTHER dollhouse. I’m still not done with my Coventry Cottage, I haven’t even started on the Willow, I’m in the middle of a scratch build, and I go and buy another house! 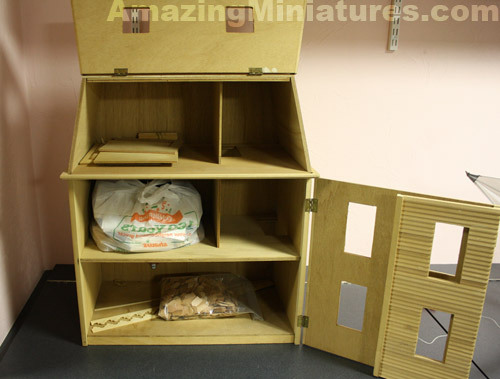 I’m really running out of hiding places and the size of this thing is pretty big (as are most dollhouses). Its currently in the basement right now, turned over to its back so it’ll look like a cardboard box. Hopefully my family won’t find it, but if they do, they’re going to kill me! I really need to stop browsing Craigslist and online shops. When I find something that I consider is a deal, I just can’t help it! This house was a find from Craigslist. The previous owners do not remember the company that made the kit or what the name of it was, but they did have a picture they cut from the box. I’m pretty sure its the Liliput Mulberry Lane by Real Good Toys from the picture they gave me and from inspecting the dollhouse. This kit sells for $200 and since the siding and shingles were included, they probably spent an extra $80 for the upgrade pieces. The previous owners bought the kit for their daughter. 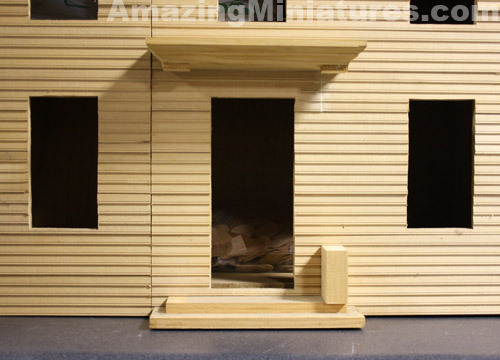 I guess they are not the DIY, crafty type of people and did not realize the amount of work that was required to finish a dollhouse kit, even on one as (relatively) easy as a Real Good Toys kit. They ended up buying one of those plastic dollhouses for their daughter instead. So they spent almost $300 on this kit and I was able to buy it from them for $40! Score! Despite the deal, the dollhouse did come with some problems. I guess after giving up on the kit and buying a plastic house for their daughter, the previous owners must have left it in their basement, because there are cobwebs, signs of mold, and some warping of the thinner pieces of wood (like the siding shown above). I’ll probably wash it over with bleach and it give it some heavy sanding before I start. I’m also debating on whether or not I should strip the siding completely and buy new siding for it or do the smart thing and try to repair it to save some moola. We shall see. 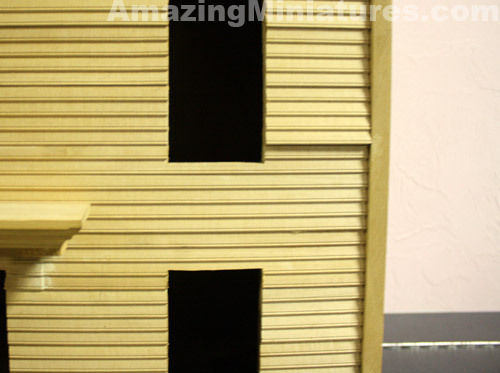 The style of the dollhouse is definitely not modern or contemporary so it will not be a long term keeper for me. The only problem now is to figure out how to find the time to work on it! 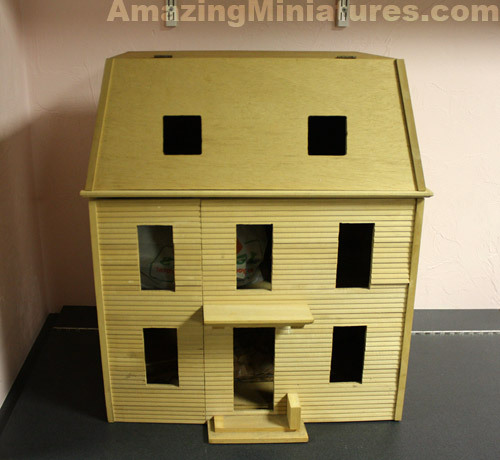 I have to laugh that you hide your new dollhouses!!! I thought of that but instead I decided to make furniture and furnishings. They are small and I can sell and redorate my house at the same time!!! I have gotten the bug to build and have made some small houses to give away to deserving friends and children. This way I’m doing it all. I laugh about it sometimes too. =) And that’s also my plan, to give away (or if I’m lucky, to sell) the houses, but I still haven’t finished one yet… the mini houses are taking over my house and my family is not too pleased that its all over the place! What a score, indeed! I have always wanted to do a RGT house, but they are certainly out of my range of moolah spending. 😉 Until you get around to working on it, you should put some dryer sheets in it to help out with any musty smell it might have. PS. Not only was I in iMag, I was also in RGT newsletter with my Christmas tree!!! Uber famous! Bwahahaha! Yeah.. I felt REALLY lucky to get this deal. $40 for most of the stuff is not bad at all. I just really, REALLY need to finish the Coventry and give that away before I can start working on the Mulberry Lane publicly lol! Ohhh! Lucky you — I got a Mulberry on Craigslist 2 years ago and loved it! Though yours is in way better shape — mine didn’t have partitions and paint was caked all over the siding and door and windows! Plus the stairs were in pretty bad shape. Ann, all I can say is welcome to the dark side of this hobby!